Super Senior – How does she do it? 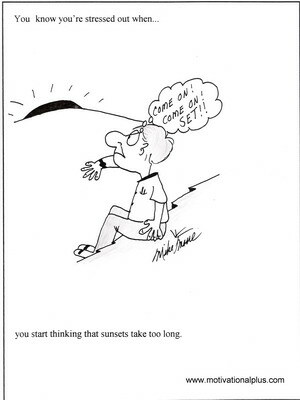 Returning from a recent trip, a friend’s email suggested I look at an article in Parade Magazine. Without that email, this wonderful read would have gone the way of the built-up unessential snail mail. 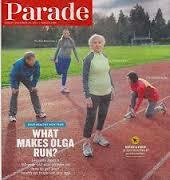 On the cover is a photo of 94-year old Olga Kotelko, a record-holding master track athlete. I’m stunned realizing Olga is a generation older than me. How refreshing that as a 66-year old, frequently the oldest woman runner at races, I can read about a competitive champion in my mother’s age group. In my closing post for 2013, I mused about the process of aging – and loss – as a senior athlete. This article is a window to a fresh mindset and a new year. Get or stay active – Does physical activity ward off those senior moments as effectively as word games or puzzles? Scientists are exploring this possibility, so why not do both? Stand when you can – In addition to track training, 94-year old Kotelko uses her stairs multiple times a day and stands while cooking. Eat healthy – You don’t have to be perfect, eschewing your favorite foods, but do eat often in smaller portions, incorporate fruits and vegetables and keep a distance from the fast food. Honor good habits – If the habit is to be at the track three days a week, you will get there regardless of your mood or life complications. If your habit is to reach for the celery sticks in place of (or in addition to) the cookies, that is what your memory and muscles will do. Develop good habits and let them go on autopilot. Log your progress – and you decide what is progress. Set up small wins for yourself. De-stress– Make a choice about what to get upset about, what you can change and what you can’t. Let the can’ts go. Hang out with active friends. It was a friend who suggested masters track to Kotelko. Kotelko in turn brought her friend, 76-year old Christa Bortignon, another world record holder, into the world of Masters Track. Share your passion for athletics with the willing, find a running group or workout group. Check web listings such as localeikki or RRCA running clubs. If the first group you try isn’t a good fit, find another. 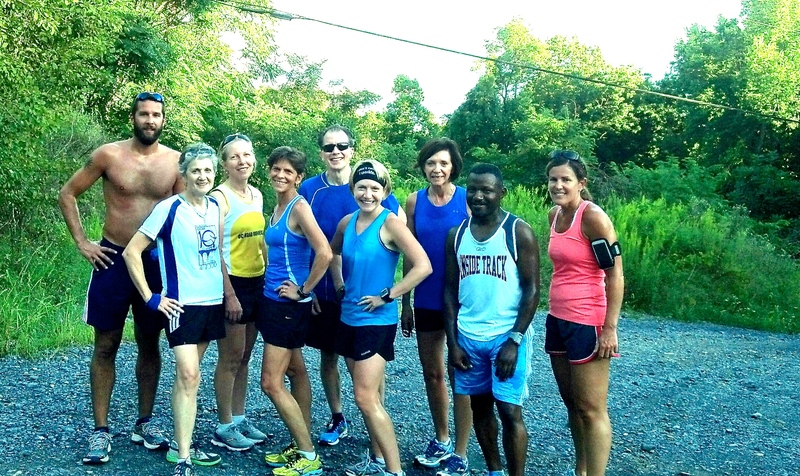 The camaraderie of an early morning run can build an unexpected new community of friends. Get a Coach – Every in-depth article I read about 60+ women making and breaking records report they work with a coach. Many of them also have regular visits to a personal fitness instructor and massage therapist or chiropractor. These masters have mastered the art of self-care to stay healthy and at the top of their field. I’d welcome any reader tips to add to my suggestions. In the meantime, Kotelko’s story has me feeling celebratory and it’s out the door in freezing temperatures to celebrate the joy of movement and to mentally rewrite my goals for the running year. I love reading about your adventures as a 66 year old runner. You are certainly my running idol! Kotelko is also truly amazing. I hope to still be running when I hit 96! Thank you. And not only does Olga Kotelko run, but she competes in the javelin and a couple of other non-running events. I guess that’s a carryover from years of competitive softball. That’s amazing! I must say that I find the most inspirational runners to be the ones who keep the passion alive throughout their lives, such as yourself. Everyone can be fast as some point and chase a PB, but to enjoy what you do for a lifetime is a far more awesome achievement. Thank you for sharing this! Thanks and I agree. To find something you love that keeps you healthy and in good company is a gift. Wow she is so inspiring! She is, and I want to learn more about her. Great post, and all good advice. So much of aging is between the ears. Many members of my writer’s workshop are much older than I am, but they all have that sparkle in their eyes, planning for the next thing. It’s a beautiful thing! And it’s contageous. Great post, and perfect timing! Jim, thanks for making the point that what is true for physical possibilities applies as well to the intellectual and the creative. Well after reading that article MaryLou we have a lot of years to catch up. Sure going to make me rethink my goals for this year. I’m doing the same. I have Grierson’s book on reading list as well. This is a great post. I agree on all of it! The folks I know 60 and older who exercise look so much younger than people even my age. It’s inspiring. And I totally agree that active friends make the difference. Being able to combine my social life and healthy habits makes it easier to do both! Thanks. I agree that many physically active people look younger than their biological age, although a lack of sun protection will show. What a wonderful story! I could not agree more with the two suggestions you added. Joining a running club with a coach has completely changed running for me. It has become such a wonderful part of my entire life now, including socially and emotionally. So glad you have had that experience as well. Although I love the occasional solo run, I gain so much from being with my group.